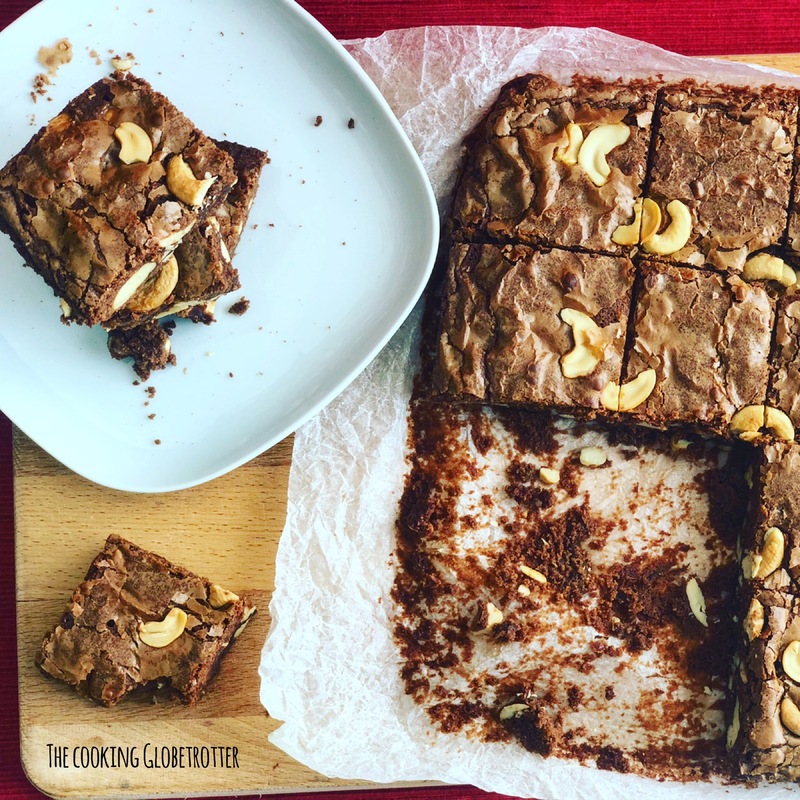 Who doesn’t love a chewy chocolaty crunchy brownie?? 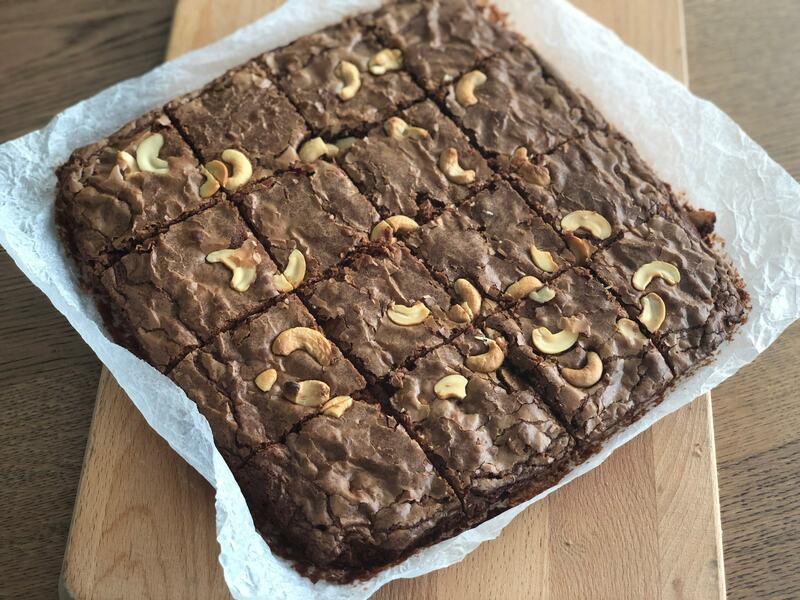 I still have a bunch of swiss chocolate Easter bunnies and so I tried a new recipe for brownies, adapting it a bit to the tropics: I used cashew nuts instead of walnuts and some palm sugar. The result was really good! Making Brownies is quite simple.. 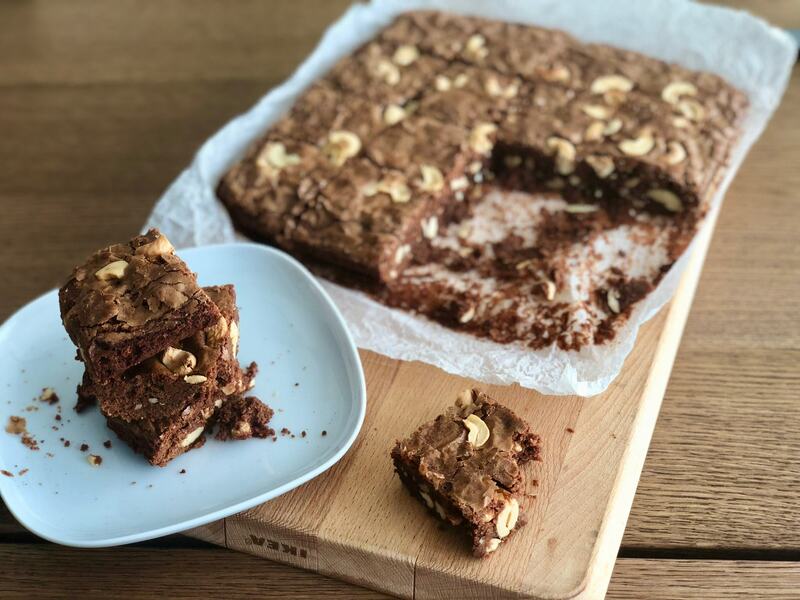 I baked them in a square baking form (23×23 cm) lined up with baking paper and they were quite thick, so if you prefer them a little smaller, use a rectangular one. Line up your baking form with wet and squeezed baking paper. In a small saucepan melt butter (225 g) and chocolate (170 g) at low heat, stirring often. In a large bowl beat the eggs (4), sugar (100 g white + 100 g palm), vanilla extract and salt until blended. I used the kitchen aid to do it. Stir in the chocolate-butter mixture while still mixing at low speed. Add the flour (130 g) and mix well. Now add the cashews (130 g, save the rest for decoration). Spread the whole mixture on your baking pan. Place the leftover cashews on the top. Bake for 35 minutes or until a toothpick will come out of the centre dry. Cool completely, I know, be patient! And then cut into squares. Serve with whipped cream or natural yoghurt or simply enjoy with a cup of coffee! Looking for more sweet inspiration? Check out my category cakes!